If Mary had a 'Little Lamb' like this, she never would have gone to school and gotten into trouble. She would've stayed home in awe, admiring the white as snow blooms that cover the plant from head to toe. She might have even stayed if she knew her plant under it's alternative (and decidely less attractive) name, 'Klein Schaapje', but then this paragraph probably wouldn't have made much sense. 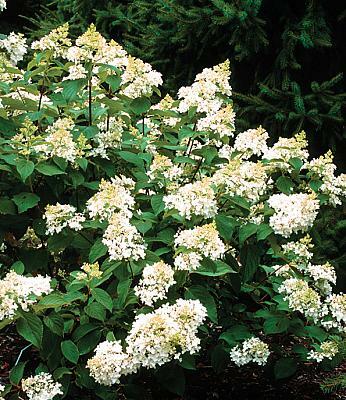 The result of Jelena de Belder's breeding program in Belgium, 'Little Lamb' is shorter and has smaller flower clusters in greater quantities than most other panicled hydrangea cultivars. Because the flowers aren't oversized (which would look silly on a shorter plant anyhow), the stems stay upright instead of bending down and hiding the blooms. Like other late-blooming hydrangea it flowers on new growth, so be sure to prune it in the winter to early spring before the buds break. Remove any old inflorescences to increase the plant's attractiveness in the summer. Although it's a drought-tolerant plant, make sure that you give it adequate moisture until it becomes established. For those of you in zones south of 7b USDA, you'll probably need to provide continual moisture to prevent burning and wilting of the foliage. Because the flowers are held upright above the plant, it's perfect in the back of a perennial border with shorter plants in front. Consider planting it with Forsythia Golden Peep and perennials like Echinacea 'Ruby Star' or Monarda 'Raspberry Wine.